Levinus Warner, envoy of the Dutch Republic to Turkey in the seventeenth century, maintained close relations with the Greek Orthodox community in Istanbul. The Protestant Dutch regarded the Orthodox Church as a potential ally in their religious controversies with Roman Catholicism. 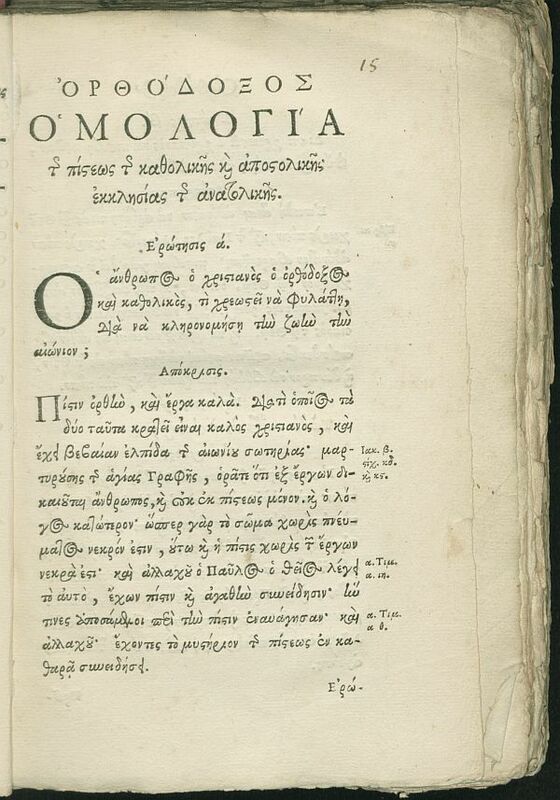 At the request of Panagiotis Nikousios, the influential interpreter of the Grand Vizier, Warner took steps to have a Greek Orthodox creed printed in the Netherlands. In 1666 the book was printed in Amsterdam by Joan Blaeu with the title Orthódoxos Homología tēs katholikēs kai apostolikēs Ekklēsías tēs anatolikēs, ‘Orthodox creed of the Catholic and Apostolic Church of the East’. Warner, however, died in 1665 and never saw the book in print. Almost the entire print run was sent along with the new envoy, Joris Croock. On his way to Istanbul Croock met with disaster in Ragusa, present-day Dubrovnik, when the city was hit by a heavy earthquake on 6 April 1667. Croock lost his life and the books were temporarily stored in Venice. A second shipment with yet another Dutch envoy was more successful and in 1668 the books arrived safely in Istanbul. Only a few copies remained in Western Europe. The Leiden copy, however, witnessed the whole journey to Istanbul and back. Most likely, the Dutch envoy gave it as a present to the French ambassador in Istanbul in 1672. In the late seventeenth century it came into the possession of Emmanuel Schelstrate of Antwerp, librarian of the Vatican. In the nineteenth century it spent several decades in the Netherlands, subsequently leaving for England to become part of the Bibliotheca Lindesiana. As a next step in this sheer endless peregrination it ended up at the ‘Zentralantiquariat’ of the former German Democratic Republic in Leipzig. From there the book was acquired by Leiden University Library in 1961 (callmark 755 H 43). In 1963-1964 both the history of the publication and the itinerary of the Leiden copy were discovered and described in great detail by Dr Keetje Rozemond, deputy librarian of Leiden University Library. This Dutch-language article found a wider international audience only in 2006, by a contribution from the Romanian scholar Dragoş Mîrşanu (Catholic University of Louvain).